The Global Navigation Menu is located on the left side of every page in Canvas. Global Navigation links provide quick access to frequently used Canvas features. These links provide access to all your courses collectively. 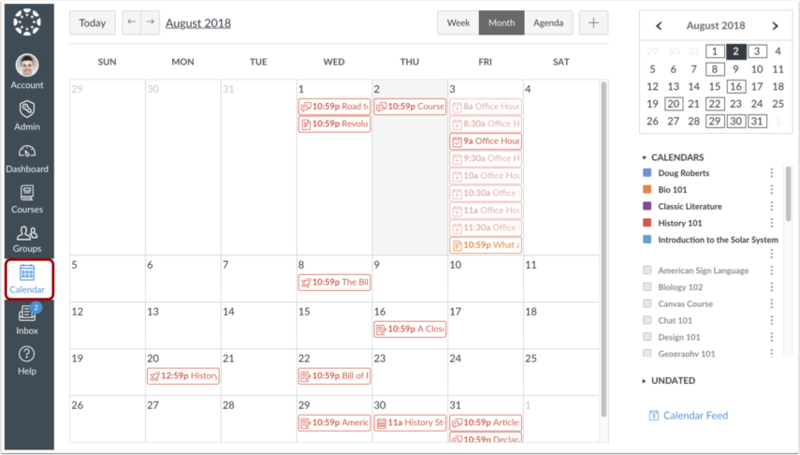 Default links include the Dashboard, Courses, Groups, Calendar, Inbox, User Account, and the Help menu. Depending on your institution account settings, other links may appear in the Global Navigation Menu. To view your user information, click the Account link. 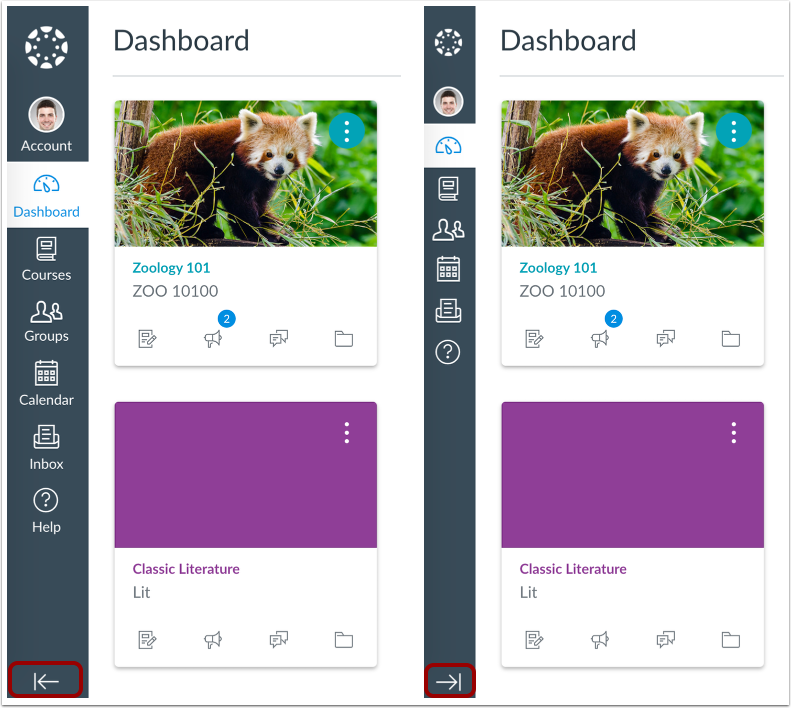 A menu will expand and display links to access your user settings, notification preferences, personal files, and ePortfolios (if enabled). If your institution has enabled Profiles, you can access your profile. You can also use the Account link to log out of Canvas. 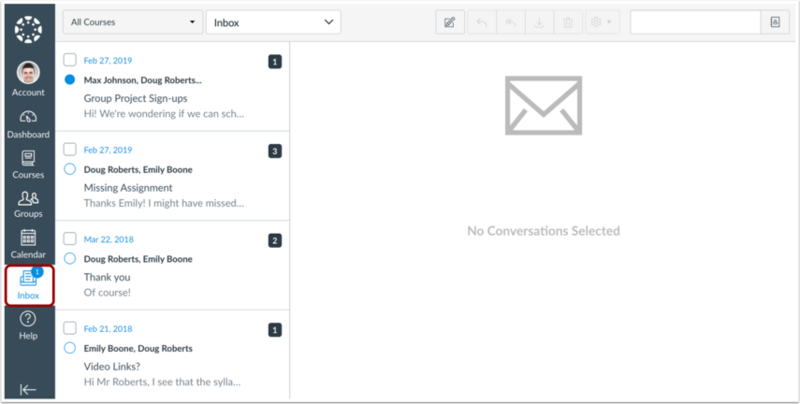 The Dashboard is the landing page after a user logs in to Canvas. 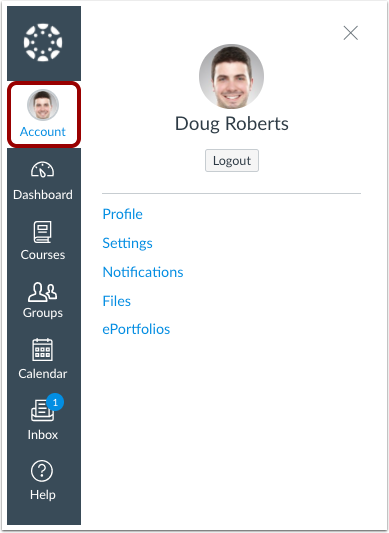 The Dashboard can be toggled to a course view or recent activity view and shows notifications for all current Canvas courses. To view your courses, click the Courses link . A menu will expand and display any current courses where you are enrolled . This menu also displays any courses marked as favorites. If no courses are selected as favorites, the course list will display all current courses. If a course includes term dates, the name of the term will appear as part of the course listing. To view a course, click the name of the course . To customize your courses list or view all your Canvas courses, click the All Courses link . 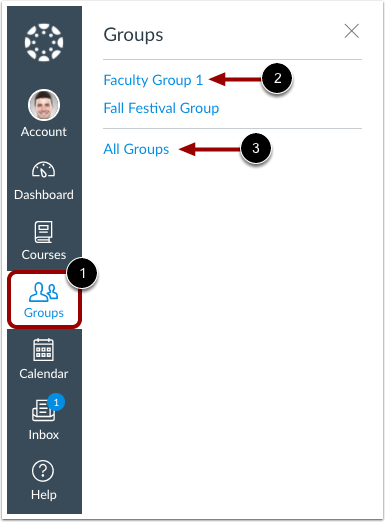 If you are enrolled in Groups, view your groups in the Groups link . 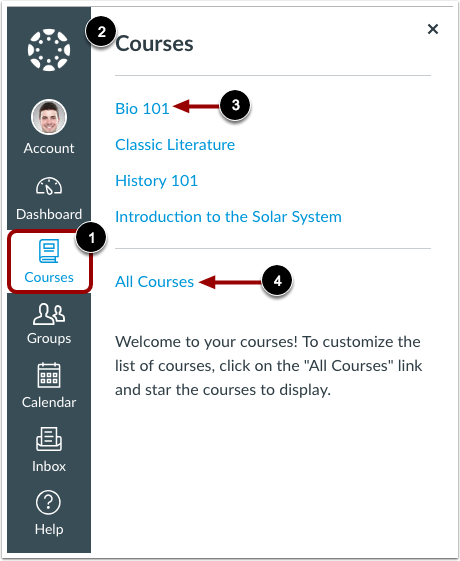 A menu will expand and display all groups in current courses where you are enrolled. To view a group, click the name of the group . To view all your groups, click the All Groups link . To view your Calendar, click the Calendar link. To view your Conversations Inbox, click the Inbox link. 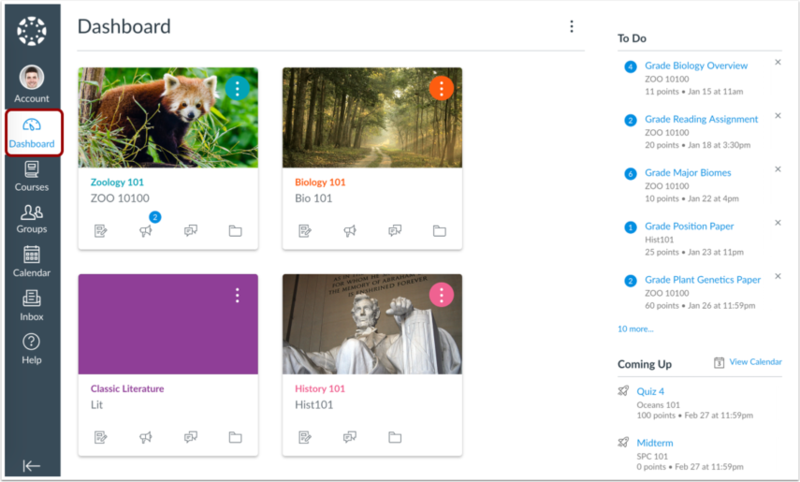 Conversations is the Canvas messaging system where you can communicate with other users in your courses. The number of new messages are shown as part of the Inbox icon. 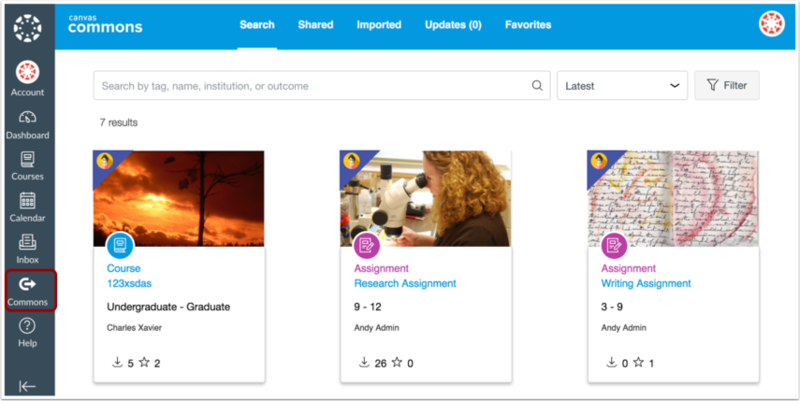 If you are an instructor and your institution is participating in Canvas Commons, you can access Commons with the Commons link. 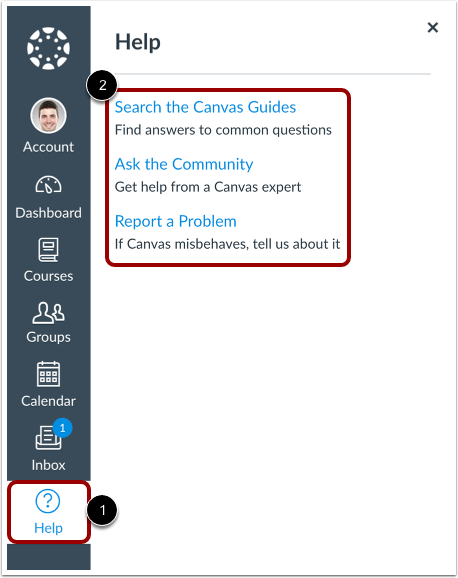 To get help with Canvas, click the Help link . Select the help option that is relevant to your needs . Note: Depending on your user role and institution settings, the Help menu may display different options. To expand or collapse the Global Navigation menu, click the arrow icon. The Global Navigation Menu will be automatically collapsed for tablet screens. Previous Topic:How do I log in to Canvas as an instructor? Next Topic:How do I use the Dashboard as an instructor? Table of Contents > Global Navigation > How do I use the Global Navigation Menu as an instructor? Re: How do I remove entire courses from last year?